THE Auditor-General has driven a stake through the heart of Julia Gillard’s claims of cabinet competence and exposed a government that is prepared to manipulate, dissemble and scheme to defeat honourable commercial and public service processes to advance Labor’s political prejudice. In a scarifying inquiry into the tender process for the $223 million contract for the Australia Network international TV service, the audit office has condemned the Gillard government for acts of incompetence and a lack of due process that have endangered Australia’s commercial reputation. But what is worse, in an extraordinary step for an auditor, the inner workings of the Gillard cabinet have been laid bare, exposing confusion and a preparedness to go against all independent advice to deliver a preferred political outcome. Facts, advice and logic were ignored, dismissed or distorted and basic principles of good governance trammelled in an all-out bid to overturn a properly considered commercial decision that the Prime Minister and Communications Minister Stephen Conroy simply didn’t like and wouldn’t accept. That this was dressed up to look like a government or cabinet decision in the national interest was a travesty and only spreads the shame and taint through a cabinet that appears to be as compliant and complicit in failure as it ever was under Kevin Rudd’s “chaotic” and bullying reign. That, at the very least, was a gross distortion of the tender decision-making process and a complete misuse of the term “right decision”. 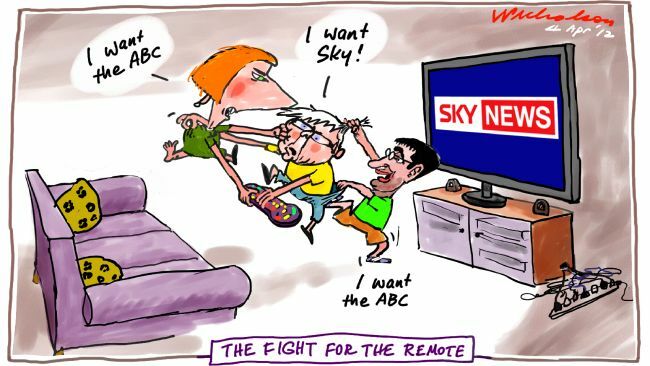 The decision to scrap the tender after an independent board had twice unanimously recommended the contract go to Sky News – one-third owned by BSkyB, which is 39 per cent owned by News Corporation, publisher of The Australian – was neither a “government” decision nor “right”. As a foreign minister facing a contentious decision on a large, 10-year contract Rudd decided, with approval, to set up a tender process that would guarantee value-for-money for taxpayers and keep politics out of a potentially politically explosive situation. When the evaluation board – representing all the key public service departments – unanimously decided the ABC did not deserve to continue the international TV service, Gillard and Conroy pulled every trick and twist in the book. First, they tried to get a new decision, then installed Conroy as the minister with extraordinary powers to override the commercial decision. Then they confected a flawed reason for terminating the whole process and simply giving it to the ABC in perpetuity. The audacity of the lies and dissembling is breathtaking. All this, every step and every decision, was taken against the advice of their own departments and the most senior public servants, who advised otherwise in the national interest and to get the best value for taxpayer dollars. The whole fiasco has cost taxpayers at least an extra $4 million in direct costs, and who knows how much in lost opportunity, as well as again damaging Australia’s reputation as a credible place to do business. Gillard may point to this “right decision” as a “run on the board”. But it’s emblematic of a delusory attempt to tell people black is white and wrong is right. Question to Stephen Conroy: Who has made up stories, minister?